With the layout planned and the panels ready, I set about installing the new display. Installing some of the objects was very straightforward, but some of the others presented their own unique challenges. 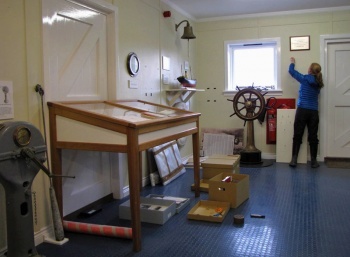 One of the trickiest items was the diving pump which had to be moved from the museum’s Allardyce Room across to the Carr Maritime Gallery. It’s a fairly heavy piece of equipment and there was no hope of me moving it myself, but thankfully I was able to enlist the help of 5 ‘ratties’ (members of the Rat Eradication Team) who did a magnificent job of not only moving the pump, but moving it incredibly carefully – my curatorial nerves were very grateful! The ratties weren’t the only ones to lend a hand though. 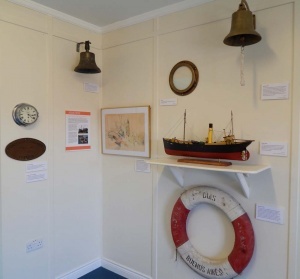 The Government builders were also hugely helpful, repainting the gallery so that it looks as good as new and answering lots of silly questions about what types of screws and wall-plugs to use! 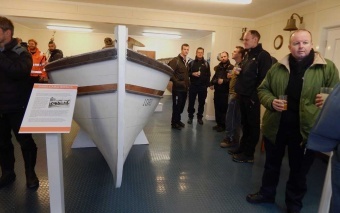 With the new display finished, we held an official re-opening of the gallery on 13th March. Happily this coincided with the visit of one of the Royal Navy ships so we could invite some of them and all the locals to help us celebrate. To go along with the nautical theme we served rum and ginger beer - a cocktail known as a ‘Dark and Stormy’. There were a couple of short speeches telling the history of the gallery and the thoughts behind the redisplay, and an opportunity to thank the many people without whose help it could not have been achieved. So, that’s one big task ticked off the list, but I won’t be putting my feet up just yet! There’s still some deep cleaning to do, a spot of accessioning to finish and a few displays to tweak – I think the next 4 weeks will also be very busy! This page was last modified 19:08, 17 March 2015. This page has been accessed 5,581 times.